TheGuarantors Agency gives you the ability to perform certain activities and gather certain information at our site(s) on the World Wide Web (the “Site”). You can use the Site to gather certain information about our products and services, to apply online for one or more of our products and services, and for certain educational content (“Online Activities”). When you access the Site, you’re agreeing to these terms and conditions of use, plus any additional terms or conditions within the Site itself (collectively “Terms and Conditions”). The Terms and Conditions are in addition to any other agreements between you and TheGuarantors Agency. TheGuarantors Agency reserves the right to modify or change the Terms and Conditions at any time without prior notice to you. Such modification or change shall be effective upon posting by TheGuarantors Agency on the Site. You agree to be bound to any changes to these Terms and Conditions when you use the Site after any such change is posted. Your Privacy and security on the site. For some Online Activities, TheGuarantors Agency permits “Online Access,” which includes the ability to use a personal computer or other access device equipped with an active connection to an Internet Service Provider to access your TheGuarantors Agency accounts, policies, or other products and to perform certain transactions as available. You may register for Online Access via the Internet. To retain the Communications sent to you electronically for your records, your system must have the ability to download (e.g., to your hard disk drive or a floppy diskette), print PDF files, or print web pages and embedded HTML files. In some cases, you must print, complete, and sign Communications with a pen, and then return them to TheGuarantors Agency according to the instructions on the document. To do this, you must have a functioning printer connected to your personal computer or other access device that is able to print Communications and the instructions on plain, white 8½ x 11 inch paper. The trademarks, service marks, slogans, logos, trade dress and other identifiers (“Marks”) displayed on the Site are the property of TheGuarantors Agency, unless otherwise disclosed. You are prohibited from using any Marks for any purpose including, but not limited to, use on other materials, in presentations, as domain names, or as metatags, without the written permission of TheGuarantors Agency. © 2014-2018 TheGuarantors Agency. All rights reserved. You are prohibited from modifying, copying, distributing, transmitting, displaying, publishing, selling, licensing, creating derivative works, or using any Content available on or through the Site for commercial or public purposes, without the prior written permission of TheGuarantors Agency. Original materials of TheGuarantors Agency posted on the Site are protected by intellectual property laws. You are granted a nonexclusive, nontransferable, limited and revocable right to access, use, display and navigate the Site solely for your personal, non-public use. You are also granted a limited and revocable license to print copies of the Content, but solely for your personal, non-public use. Except as expressly provided above, all rights are reserved. Any commercial or public use of the Site or any of its Content is strictly prohibited without written permission from TheGuarantors Agency. Except as expressly provided above, no portion of the Site, its Contents or any copyright, trademark, trade name, service mark or any other proprietary information of TheGuarantors Agency (collectively, the “Intellectual Property”) displayed on the Site or on any of the Content may be reproduced, altered, removed, transmitted, published or distributed, whether electronically, mechanically, by photocopy, recording or otherwise, without the prior written permission of the TheGuarantors Agency. Use of any TheGuarantors Agency trademarks as metatags on any third-party Web site is strictly prohibited. You may not Co-Brand the Site or display the Site in frames (or any of the Content via in-line links) without prior written permission from TheGuarantors Agency. “Co-brand” means your display of any of the Intellectual Property, or your taking of other means of attribution or identification of TheGuarantors Agency in such a manner reasonably likely to give a third party the impression that you or such third party has the right to display, publish or distribute the Site or any of its Content. You agree to cooperate with TheGuarantors Agency in causing any unauthorized co-branding, framing or linking to immediately cease. From time to time, TheGuarantors Agency may authorize Linked Web Sites (as defined herein) to or from the Site. Linked Web Sites are controlled and operated by third parties and not by TheGuarantors Agency. TheGuarantors Agency makes no representations and disclaims all liability as to the content or material available at those locations, the accuracy of information, and the quality of products or services provided or advertised on Linked Web Sites. The fact that TheGuarantors Agency authorizes Linked Web Sites is not an endorsement, authorization, express or implied sponsorship, or affiliation with respect to Linked Web Sites, its owners, sponsors, or providers. TheGuarantors Agency operates the Site from its offices within the United States. TheGuarantors Agency does not represent that Content on the Site is appropriate or applicable for use in any other country, and access from certain countries other than the United States may be strictly prohibited. You acknowledge and agree that you are accessing the Site on your own initiative, at your own risk, and are responsible for compliance with all local laws. These Terms and Conditions shall be governed by and construed in accordance with the laws of the United States and the State of Delaware. You consent to exclusive jurisdiction and venue in New York County, New York and waive the defense of forum non conveniens. TheGuarantors Agency values your feedback; however, we ask that you not submit to us any suggestions, materials, ideas or creative concepts for new, modified or different products or services via the Site. TheGuarantors Agency requests this in order to avoid confusion in the future regarding the origin of the concept, product or service. 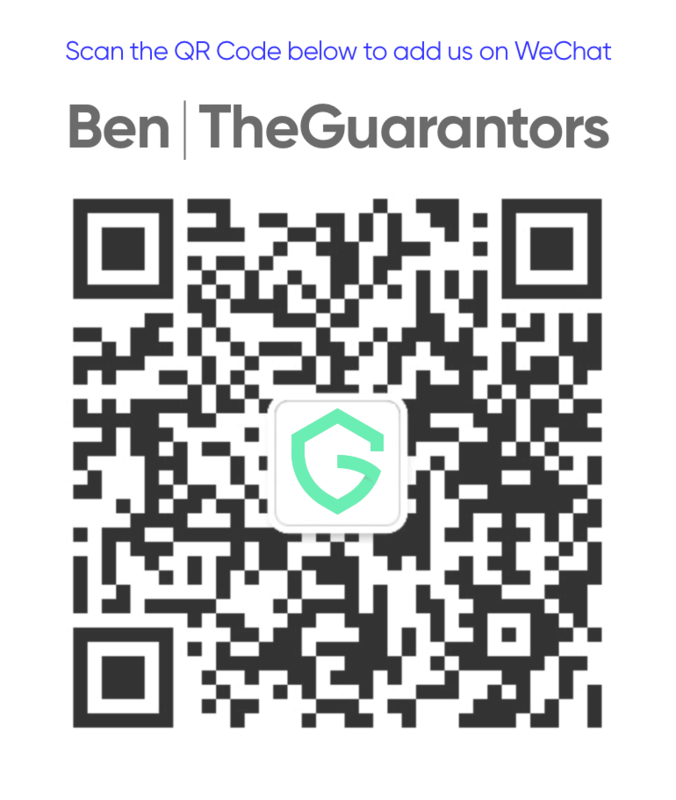 If, despite our request that you not send us any creative materials, you still send us creative suggestions, ideas, concepts or other information (collectively, the “Information”), such Information shall be deemed by TheGuarantors Agency to be, and shall remain, the property of TheGuarantors Agency. None of the Information shall be subject to any obligation of confidence on the part of TheGuarantors Agency and TheGuarantors Agency shall not be liable for any use or disclosure of any Information. Without limiting the foregoing, TheGuarantors Agency shall exclusively own all rights to the Information of every kind and nature and shall be entitled to unrestricted use of the Information for any purpose whatsoever, commercial or otherwise, without compensation to the provider of the Information. All communications initiated by you (also defined herein as a “Visitor”) and made to or through portions of the Site that permit uploading of questions, comments or other material are hereby considered “Visitor Submissions”. Visitor Submissions become the property of TheGuarantors Agency and you grant TheGuarantors Agency a non-exclusive, royalty- free, perpetual, irrevocable, fully transferable, sub-licensable and assignable right to use, edit, modify, adapt, translate, edit, and reformat Visitor Submissions as necessary and for any purpose, anywhere in the world, including into those forms that may constitute advertising. If you submit a Visitor Submission, you are also hereby granting to TheGuarantors Agency the non-exclusive right to seek enjoinment and possible damages from any third party who otherwise uses Visitor Submissions in an unauthorized way or through unauthorized reproduction of any Visitor Submission. Visitor Submissions used, displayed or propagated by TheGuarantors Agency or others licensed by TheGuarantors Agency to use Visitor Submissions may be attributed to you unless the visitor has expressly requested anonymity. TheGuarantors Agency reserves the right to select among the Visitor Submissions for the most appropriate material to be used, subject to TheGuarantors Agency sole discretion and judgment. TheGuarantors Agency otherwise reserves the right to remove Visitor Submissions from the Site pursuant to its discretion and judgment, but maintains no obligation to do so. Visitors also hereby agree to not redistribute or reproduce elsewhere Visitor Submissions in any manner or in any media, including the re-submission or republishing of any Visitor Submission on any other site not affiliated with TheGuarantors Agency. IN NO EVENT WILL TheGuarantors AGENCY ITS RESPECTIVE SERVICE PROVIDERS, EMPLOYEES, AGENTS, OFFICER, SHAREHOLDERS AND DIRECTORS BE LIABLE TO YOU FOR ANY PUNITIVE, INDIRECT, DIRECT, SPECIAL, INCIDENTAL OR CONSEQUENTIAL DAMAGES, INCLUDING ANY LOST PROFITS, COSTS OF PROCURING SUBSTITUTE SERVICE OR LOST OPPORTUNITY, EVEN IF YOU HAVE NOTIFIED TheGuarantors AGENCY ABOUT THE POSSIBILITY OF SUCH DAMAGES, OR FOR ANY CLAIMS BY ANY THIRD PARTIES ARISING OUT OF OR IN ANY WAY RELATED TO THE ACCESS, USE OR CONTENT OF THE SITE OR A LINKED WEB SITE WHETHER SUCH CLAIMS ARE BROUGHT UNDER ANY THEORY OF LAW OR EQUITY. TheGuarantors Agency has the right to deny you access and use of the Site and its Content (as defined herein) if you violate (as TheGuarantors Agency may determine in their sole and absolute discretion) any provision of the Terms and Conditions. TheGuarantors Agency reserves the right to seek all other remedies available at law and in equity. You agree, at your own expense, to defend, indemnify and hold TheGuarantors Agency harmless from any claim or demand, including reasonable attorneys’ fees, made by a third party in connection with or arising out of your access to, or use of, the Site or any of its Content in a manner other than as expressly authorized by the Terms and Conditions, your breach of the Terms and Conditions or your violation of applicable laws or any rights of any third party. ALL INFORMATION AND OTHER MATERIALS PRESENT ON THE SITE (“CONTENT”), INCLUDING, WITHOUT LIMITATION, PRODUCTS AND SERVICES ARE PROVIDED “AS IS,” WITHOUT ANY WARRANTIES ABOUT THE CONTENT’S NATURE OR ACCURACY (EITHER WHEN POSTED OR AS A RESULT OF THE PASSAGE OF TIME) AND WITHOUT ANY REPRESENTATIONS OR GUARANTEES. WITHOUT LIMITING THE ABOVE, TheGuarantors AGENCY DISCLAIMS ALL WARRANTIES, EXPRESS OR IMPLIED, INCLUDING, BUT NOT LIMITED TO WARRANTIES OF MERCHANTABILITY, FITNESS FOR A PARTICULAR PURPOSE, TITLE, NON-INFRINGEMENT, SECURITY OR ACCURACY WITH REGARD TO ANY WEB SITE OWNED BY A THIRD PARTY TO WHICH OR FROM WHICH THE SITE IS LINKED (“LINKED WEB SITE”). TheGuarantors AGENCY DOES NOT ENDORSE AND IS NOT RESPONSIBLE FOR THE CAPABILITIES OR RELIABILITY OF ANY PRODUCT OR SERVICE OBTAINED FROM A LINKED WEB SITE. THE INFORMATION, PRODUCTS, SOFTWARE OR SERVICE DESCRIPTIONS PUBLISHED ON THE SITE OR A LINKED WEB SITE MAY INCLUDE INACCURACIES OR TYPOGRAPHICAL ERRORS. THE COMPANY DISCLAIMS LIABILITY FOR SUCH ERRORS AND DOES NOT WARRANT OR REPRESENT THAT THE CONTENT ON THE SITE OR A LINKED WEB SITE IS UPDATED OR COMPLETE. TheGuarantors AGENCY HAS NO OBLIGATION TO UPDATE ANY CONTENT ON THE SITE AND MAY CHANGE OR IMPROVE THE SITE AT ANY TIME WITHOUT NOTICE. TheGuarantors Agency does not endorse and is not responsible for the accuracy or reliability of any opinion, advice or statement made through the Site by any party other than TheGuarantors Agency. TheGuarantors Agency make no representations, warranties or guarantees that the Site will be accessible continuously and without interruption, or error free. Product, coverage, discounts, insurance terms, definitions, and other descriptions are intended for informational purposes only and do not in any way replace or modify the definitions and information contained in your individual insurance contracts, policies, and/or declaration pages from TheGuarantors Agency- affiliated underwriting companies, which are controlling. Such products, coverages, terms, and discounts may vary by state and exclusions may apply. Products underwritten by Our Insurance Partners. Products and discounts are not offered by all companies nor are all products and discounts available to all persons in all states, and at all times are subject to underwriting guidelines, review, and approval. Except to the extent otherwise set forth in the Terms and Conditions, these Terms and Conditions set forth the entire understanding between TheGuarantors Agency and you with respect to your access to, and use of, the Site and its Content and supersedes all prior or contemporaneous understandings regarding access and use. Failure by TheGuarantors Agency, in any instance, to exercise any of its rights under the Terms and Conditions will not constitute waiver of such right or any other rights under the Terms and Conditions.